Our projections are absolutely critical when it comes to setting lineups and making roster moves. This article will discuss two types of projections: Point based projections that you typically see in an NFL league and category based projections that you typically see in all other sports. All projections will showcase a range in each box in the form of a simple line graph for your position or category. 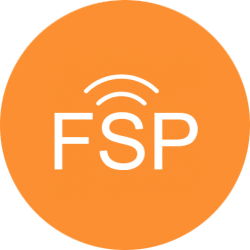 We will go more in depth as to what that means below and how to best utilize that information. Projections in this section are either Weekly/Daily or Season Projections to see how your team would currently perform if you started these players from today until the end of the season. 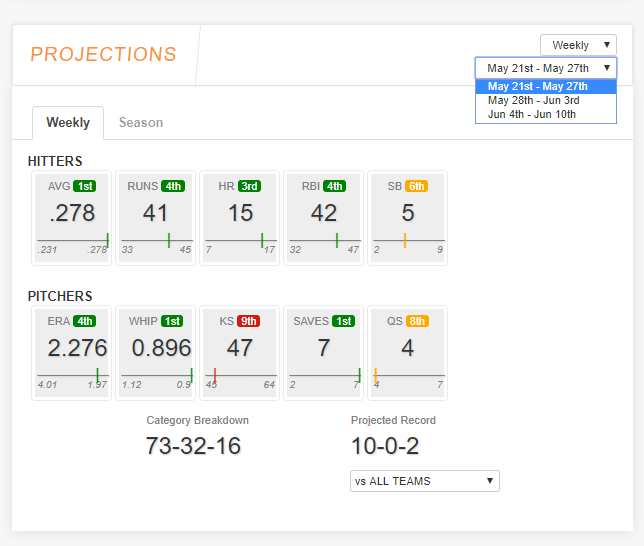 We highly suggest putting an emphasis on Weekly or Daily Projections rather than Season Projections. If you concentrate on the week-to-week then your season projections will take care of themselves. Above is what you might typically see in your NFL league. The projections are broken down by positions. You can see the total projected points, the projected record, and you can break it down by a specific matchup. 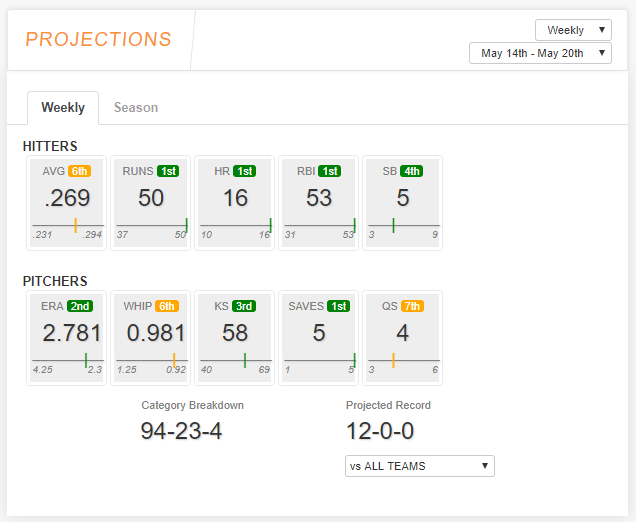 In this example, I have a pretty good projection of around 136 points and have a projected record of 7-4 across the entire league. Let&apos;s focus on the quarterback projection. I am projected to have 19 points this week and ranked 7th out of 12 teams. Meanwhile the entire league quarterback projections range from 13 to 30.8. This provides a sense of where your quarterback fits in compared to the rest of the league. The orange line indicates where your projection compares and it&apos;s basically telling me that my quarterback is pretty average. Take note of the tight end position. I am projected to have the best week out of the entire league thanks to Travis Kelce (as of this writing). Meanwhile my defense is projected to be among the league worst and rank 10th of 12. Take this information and try to bolster the positions that you are the worst in. Is there a better defense out there? Is my backup quarterback worth starting over the current starter? If my team is weak in a specific position, maybe I can formulate a trade? Learn more about finding free agents to help answer these questions. 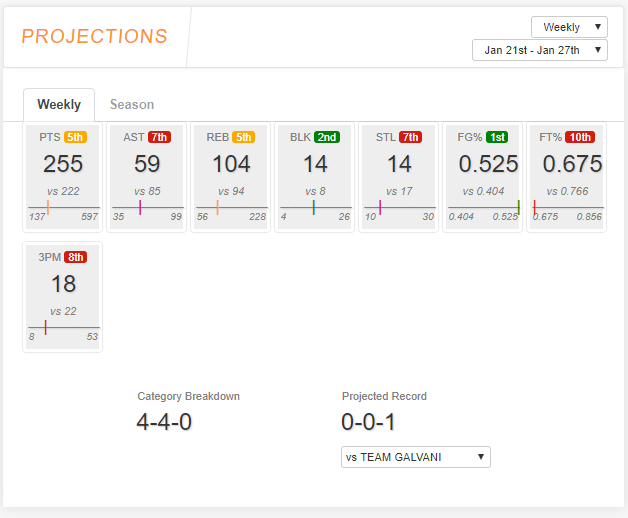 Category based projections work similarly to point based projections except the focus is on specific categories that your league&apos;s scoring system will use in a week-to-week or daily basis. 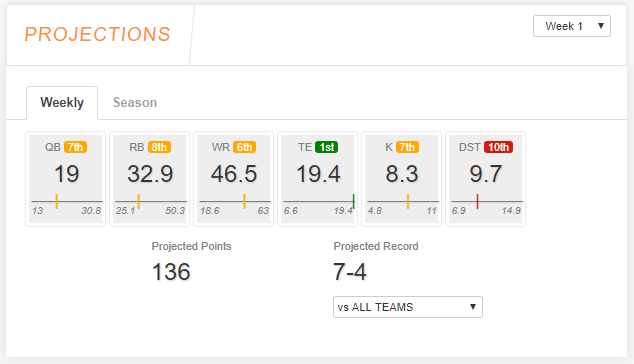 These projections will show how your team compares to the rest of the league. As you can see, the weekly projection is incredible across the board and something you should shoot for every week or day, which is to be amongst the league best. I am first in four of the 10 possible categories. The color green indicates solid projections, meanwhile orange indicates average projections that can be improved. The color red would indicate poor projections. Let&apos;s take a closer look at the RUNS category. I am projected to have 50 runs this week, meanwhile the range for the entire league is 37-50. My team is weakest in quality starts, WHIP, and batting average. Use this information to your advantage. Perhaps this week I may want to try to improve in quality starts by sacrificing SAVES. I can do that by playing a better closer or benching a starting pitcher for another closer. It all depends on what category means the most to you. You can select the team you are playing by selecting the vs ALL TEAMS dropdown and picking your opponent. This can better help you narrow down potential lineup moves you should make. When selecting your opponent, your projection is the BOLD number and their projection is the smaller number. Notice the dropdown box where it shows Weekly? Click or press this box and you have the option to switch to Daily. This will refresh the entire page and alter everything you see to projections for today or the week. A second dropdown box is listed in the top right corner and allows you to move ahead in time. The options presented will be either Weekly future projections or Daily future projections. Once you make the selection, the entire page will refresh and apply these changes.